The D600 is arguably the very first affordable full-frame Nikon DSLR, and for many still photographers, it will be nothing less than a dream come true. Over time we film photographers have adapted to the limitations of DX-sensor digital cameras, and their 1.5x crop factor, but spend a day shooting with the D600 and it's like coming home. Here, at last, is 35mm photography as it was meant to be. The advantages of the FX sensor are like a lush rainforest in comparison to the DX wasteland. In this review, however, I'm only going to offer a very few comments on the D600's still photography capabilities. That's because, excluding some specialty (primarily high-speed sports) applications, the D600 will abundantly satisfy the needs of most photographers. Let's face it: camera technology has advanced to the point where it no longer makes sense to upgrade purely for better image quality. Today, what matters is fitting the tool to the job. In that sense, as I say, the D600 is a brilliant if not quite economical ($2,099.95 at Amazon) choice for all those patient photographers who have long coveted a 'prosumer' Nikon FX body. Body size and weight are very close to Nikon's DX-class D7000, making the D600 notably smaller and lighter than a D800. Image quality, even with the kit 24-85mm lens, is stunning. That said, I bought my D600 not for still photography but for video. Nikon marketing materials are implying the D600 brings the very same video imaging capabilities as found in the much more expensive and quite impressive D800. Following my testing with the D600, I find myself thinking of that old adage, 'There's no such thing as a free lunch'. DSLR filmmaking/cinematography is a quirky business, to be sure, but it has caught fire because of its ability to affordably replicate the stratospherically-expensive look of Hollywood 35mm film productions. DSLRs tend to excel in any scene in which a natural subject (ie, a person's face) is isolated against a blurred background. Don't be fooled when you see so-called 'test' footage of the D600 or any other DSLR shooting under these conditions—that's like judging a professional basketball player's ability solely on his dunking skills. For the considerable perks of being able to use quality 35mm film lenses and a large DX or FX sensor, DSLRs come with the equally significant liabilities of suffering from handling, aliasing, and moire issues. If you are used to the effortless utility of a small-chip camcorder, including excellent autofocus, autoexposure, zoom, manual controls, and more, the move to DSLR video is a rude awakening indeed. In fact, whenever you see a video like this, be aware that experienced professional DSLR cinematographers are using very sophisticated techniques plus expensive aftermarket gear to get these looks. As for aliasing and moire, these are technology-based distortions caused by taking a DSLR's raw Bayer-patterned sensor data (6016x4016 pixels for the D600) and converting it into a 1920x1080 pixel, full color image 30 times per second. Aliasing is most noticeable where there are straight or (worse) diagonal lines. Moire, or false color patterns, occur when scenes contain patterns like screens, chain link fences, or even wood grain on furniture. In my admittedly imperfect D600/D800 video comparison, the D800 delivers a noticeably more neutral and I would say slightly better picture overall. Both cameras suffer from moire and aliasing, with the D600 always the worse of the two. The D800's moire/aliasing is probably already pushing the limits for professional video imaging. The D600 was supposed to be better—at least, we all hoped it would be better. It isn't. Contrast and sharpness are stronger/crunchier in all picture profiles with the D600, so it may be possible to get closer to the D800's look with careful settings tweaks. 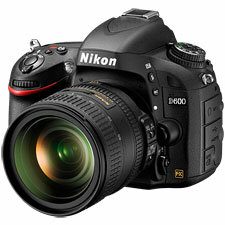 And, to be sure, you can get stunning video with the D600. You'll just need a lot of skill and savvy to do so. Does the D800 enjoy a commanding advantage when it comes to video? I'm not so sure. There is the extra $900 to account for. And while D800 footage does look better, the difference is subtle (aside from the D600's crippled HDMI output). In either case, neither camera is likely to challenge Canon's dominance when it comes to DLSR filmmaking. So, for now, the Nikon pro video outlook remains unfortunately a bit murky—in either the D800 or D600.